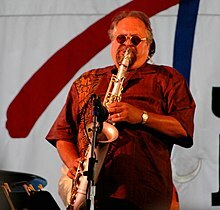 Joseph Salvatore Lovano (born December 29, 1952) is an American jazz saxophonist, alto clarinetist, flautist, and drummer. He has earned a Grammy Award and several mentions on Down Beat magazine's critics' and readers' polls. He is married to jazz singer Judi Silvano with whom he records and performs. Lovano was a longtime member of a trio led by drummer Paul Motian. Lovano was born in Cleveland, Ohio, to Sicilian-American parents; his father was the tenor saxophonist Tony ("Big T") Lovano. His father's family came from Alcara Li Fusi in Sicily, and his mother's family came from Cesarò, also in Sicily. In Cleveland, Lovano's father exposed him to jazz throughout his early life, teaching him the standards, as well as how to lead a gig, pace a set, and be versatile enough to find work. Lovano started on alto saxophone at age six and switched to tenor saxophone five years later. John Coltrane, Dizzy Gillespie, and Sonny Stitt were among his earlier influences. After graduating from Euclid High School in 1971, he went to Berklee College of Music, where he studied under Herb Pomeroy and Gary Burton. Lovano received an honorary doctor of music degree from the college in 1998. After Berklee he worked with Jack McDuff and Lonnie Smith. He spent three years with the Woody Herman orchestra, then moved to New York City, where he played with the big band of Mel Lewis. He often plays lines that convey the rhythmic drive and punch of an entire horn section. 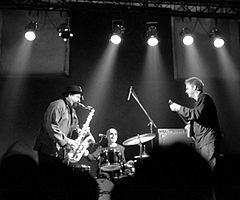 In the mid 1980s Lovano began working in a quartet with John Scofield and in a trio with Bill Frisell and Paul Motian. In 1993, he played on the album Anything Went by guitarist Bill DeArango, a native of Cleveland. In the late 1990s, he formed the Saxophone Summit with Dave Liebman and Michael Brecker (later replaced by Ravi Coltrane). Streams of Expression (2006) was a tribute to both cool jazz and free jazz. Lovano and pianist Hank Jones released an album together in June 2007, entitled Kids. He played the tenor saxophone on the 2007 McCoy Tyner album Quartet. In 2008 Lovano formed the quintet Us Five with Esperanza Spalding on bass, pianist James Weidman, and two drummers, Francisco Mela and Otis Brown III. Folk Art was an album of compositions by Lovano that the band hoped to interpret in the spirit of the avant-garde jazz and loft jazz of the 1960s. Bird Songs (2011) was a tribute to Charlie Parker. West African guitarist Lionel Loueke appeared on the album Cross Culture (Blue Note, 2013). Lovano played reed and percussion instruments he had collected since the 1970s. Peter Slavov replaced Esperanza Spalding on six tracks, all of them written by Lovano except for "Star Crossed Lovers" by Billy Strayhorn. "The idea [...] wasn't just to play at the same time, but to collectively create music within the music," Lovano wrote in the liner notes to Cross Culture. "Everyone is leading and following," and "the double drummer configuration adds this other element of creativity." Lovano has taught at the Berklee College of Music. He taught Jeff Coffin after Coffin was given a NEA Jazz Studies Grant in 1991. Downbeat magazine gave its Jazz Album of the Year Award to Lovano for Quartets: Live at the Village Vanguard. Lovano has played Borgani saxophones since 1991 and exclusively since 1999. He has his own series called Borgani-Lovano, which uses Pearl-Silver Alloy with Gold 24K keys. ^ a b c d "Joe Lovano." Contemporary Musicians. Vol. 13. Farmington Hills, MI: Gale, 1994. Retrieved via Biography in Context database, May 5, 2017. ^ "Joe Lovano - Biography & History". AllMusic. Retrieved March 9, 2019. ^ Heckman, Don (May 17, 1992). "Joe Lovano: Following in the Big T's Footsteps". Los Angeles Times. latimes.com. Retrieved May 5, 2017. ^ Mosbrook, Joe (September 16, 1996). "Jazzed in Cleveland: Part Twelve". Cleveland, the New American City website. Retrieved 2012-05-16. ^ "Lovano, Joe". Encyclopedia of Jazz Musicians. jazz.com. Archived from the original on April 14, 2016. Eds. Tim Wilkins and Ted Giola; originally compiled by Lewis Porter. ^ a b "Joe Lovano | saxophone | Blue Music Group". Joelovano.bluemusicgroup.com. Retrieved 2013-01-15. ^ Cf. Folk Art on Lovano's homepage. ^ About Bird Songs on Lovano's homepage. ^ Eugene Holley Jr. (January 15, 2013). "Joe Lovano Us Five at Longwood Gardens". Philadelphia Weekly. Archived from the original on February 16, 2013. Retrieved January 18, 2013. ^ About Cross Culture on Lovano's homepage. ^ Small, Mark. "Joe Lovano '72 Will Be First to Occupy Gary Burton Chair in Jazz Performance". Berklee Today. Retrieved November 22, 2011. ^ "Clinics/Education Jeff Coffin Music". Jeffcoffin.com. Retrieved 2013-01-15. ^ Joe Lovano. "Pearl Silver body and Gold 24K keys". borgani.eu. Retrieved January 18, 2013. ^ Paul Verna (25 January 1997). Reviews & Previews. Billboard. Nielsen Business Media, Inc. p. 59. ISSN 0006-2510.